The exhibit, which opened Dec. 1, explores innovative housing, shelter and other designs that may help communities survive and thrive in a changing climate. Produced by the Oakland, California-based Art Works for Change, the traveling exhibit showcases designs from around the world. From mushroom-based building blocks to coats that transform into sleeping bags, the designs emphasize portable, sustainable and small-footprint products that can be adapted for a variety of needs while minimizing environmental impacts. 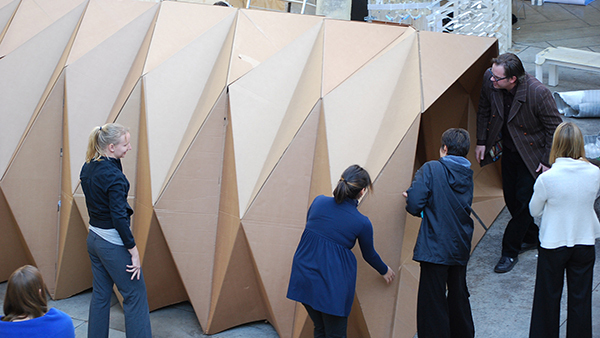 At one station, visitors can check out a new, instant-shelter technology from the California nonprofit Cardborigami. Constructed of naturally insulating, water- and flame-resistant cardboard, the structures store flat and can be unfolded in seconds, offering an emergency shelter solution for people facing homelessness or natural disaster scenarios. Visitors to the exhibit can examine a sample structure in its folded form, climb inside a fully expanded version and create their own origami pieces. The museum has added a UO dimension to the exhibit, highlighting eco-conscious designs by students and faculty members in the School of Architecture & Environment. At a video station, visitors can learn about the award-winning “Outside House” developed by Erin Moore, head of the School of Architecture & Environment. The house, located in Maui, Hawaii, incorporates two tiny, low-impact structures with an expansive natural landscape to create a sense of spaciousness with a small footprint. In another section, visitors can explore architecture students’ projects aimed at rebuilding the infrastructure and social and housing fabric of a Puerto Rican community devastated by hurricanes Irma and Maria.